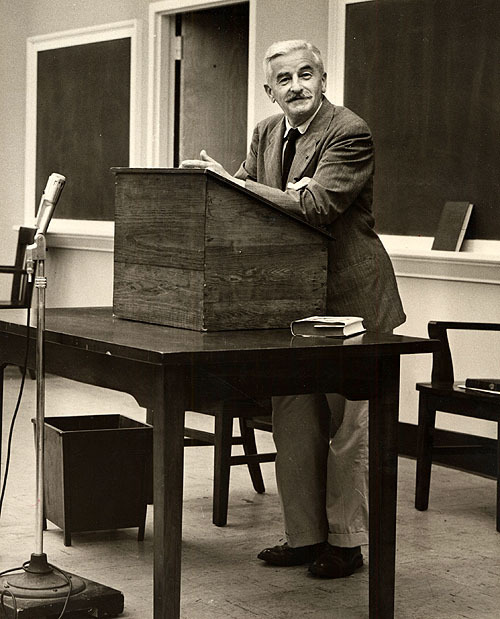 William Faulkner in a Cabell Hall classroom at the University of Virginia, probably February 1957. Photograph by Ralph Thompson. In case you missed the recent Newsweek article about the newly released audio tapes of William Faulkner, take note. Stephen Railton, in collaboration with the University of Virginia Library, has written and directed an audio archive called Faulkner at Virginia. It’s a fascinating online collection that features recordings of Faulkner during his two terms as Writer-in-Residence at UVA (1957 and 1958). During that time, Faulkner spoke at thirty-six different public events, gave two addresses, read a dozen times from eight of his works, and answered more than 1,400 questions from diverse audiences. Most of those sessions were recorded on a reel-to-reel tape recorder. Now, thanks to the UVA archive, listeners can hear more than 28 hours of those recordings. Find tons of fascinating Faulkner information by visiting the online archive.